AT THE NFL tryouts two weeks ago, reports came out that teams were interested in knowing Manti Te’o's sexual orientation. Under New York State law, along with laws in states that are home to “at least 20 of the League’s 32 teams” locations, it is illegal for an employer to discriminate against potential hires because of their sexual orientation, New York Attorney General Eric Schneiderman said in a letter to NFL chief, Roger Goodell today. “Memorialise this commitment in a written policy” and distribute the policy throughout the League. Advise NFL prospects to to contact League officials if they have ever been asked questions about their sexual orientation. Schneiderman also wants to meet with the League staff investigating the incidents reported by Kasa and other players about the sexual orientation questions asked at the NFL combine. 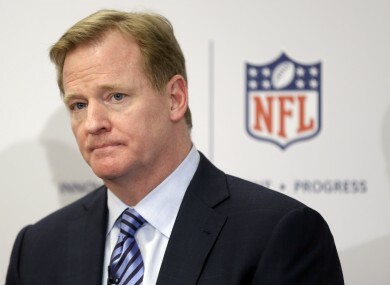 Email “NFL under investigation for discriminating against gay players”. Feedback on “NFL under investigation for discriminating against gay players”.